Born in 1882, Georges Braque was a Parisian painter from the 20th century. 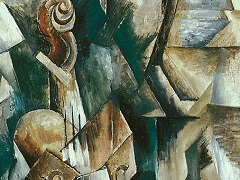 He was most well known for being the founder of Cubism alongside famous artist Pablo Picasso. In addition to the invention of Cubism, he did also focus on other forms of art which were prominent during this time period as well. He did work which touched on Impressionism, fauvism, and even focused on collage styles of work, which brought together a series of imaginative pieces, bold colors, and distinct shapes and styles to his work. During the wartime period, the work he put together would change in order to represent the somber, dark period the world was going through. In between wartime, he would also change the style and themes, to represent lighter times, and happier things which were taking place around him. Although he did change his style, tone, color use, and design features, he never strayed too far away from Cubism. There were also tinges or hints of this style, in every piece that he created during the course of his career, and is the reason his work was so distinct, in comparison to other artists of the time, who did not delve in to as many different forms in their work. Early in his life, Georges Braque wanted to focus on painting, so moved from the smaller town he was born in, to Paris. This not only allowed him to be around more painters of the period, it also allowed him to see what was out there, and what styles were prominent during his time. Prior to painting at the Academy of Humbert, he apprenticed for a short period of time with a house decorator. Early on in his art career, much of the style which he focused on was that of impressionism, the 19th-century art movement that originated with a group of Paris-based artists, main Impressionists and post-impressionists include Cezanne, Monet, and van Gogh. A distinctive feature of his works during that period was not only a unique decorative beauty but also much more vivid than that of other artists, constructiveness of the composition. Unlike other fauvist painters, Braque paid attention not only to the position of the color elements on the plane of the picture but also to building space. Even at that time, he was inspired by Cezanne more, than by Van Gogh. Shortly after 1905, he made the transition over to fauvism, and followed many of the color schemes, and design aspects which were more prominent in this form of art. During this time he was in a series of exhibitions, and was around artists like Henri Matisse and Andre Derain. Loose form structures, along with bold color schemes to convey the deep emotions of the artist and his subject, were prominent in his work, and in the fauvism style in general. 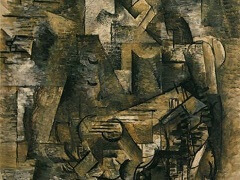 1908 was when Georges Braque took part in his first solo exhibit; from 1909 up to 1914, he spent a majority of his career working with Picasso. This was when the two men focused on developing a new style of art, and a new depth to what fauvism had already brought to the art world. 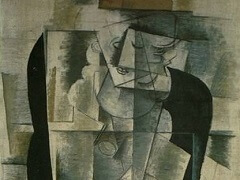 The two developed new themes, bold lines, and a series of darker color schemes, and created the Cubism style. 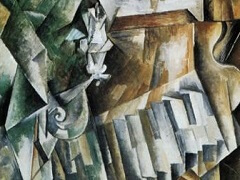 The Cubists challenged conventional forms of representation, such as perspective, which had been the rule since Renaissance Art. Their aim was to develop a new way of seeing which reflected the modern age. 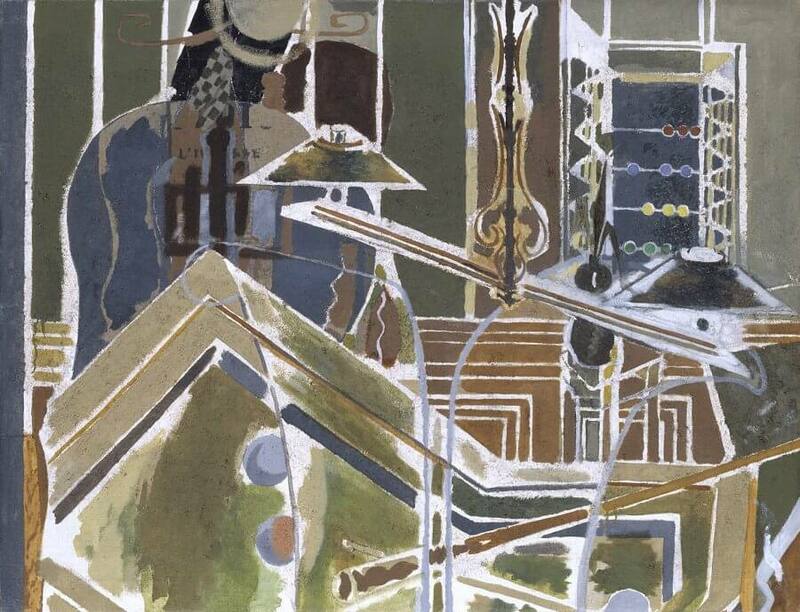 Georges Braque also incorporated collages, and the use of the entire canvas, to convey pieces that were created. Collages were a major addition and style which he followed during this period in his art work as well. 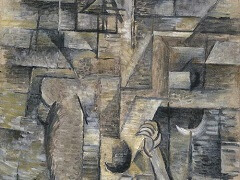 Following WWI, the style that Georges Braque followed changed once again. It was less planned and structured, so he did not really have a focal theme in the types of work he created. In 1922, he had a very successful solo exhibit in Paris, which not only garnered much attention to his work, but also to the new form which he and Picasso had introduced. It not only showcased the new color and collage style paintings, it also helped propel him to the front of the art world, as a prominent name during this period. During the end of the 1920s, the works created by Georges Braque took yet another transformation in style and tone. He began to focus more so on real interpretations, and focused much of his work on nature, and natural light. Even though this was the third stylistic change he had made in the decade alone, his work never seemed to stray too far from the Cubism style which he created. So, square, straight lines, and bold colors, were always seen in the images which he displayed on the canvas. There were always aspects of the cubism style, in every piece he created, regardless of which period he was working in, or which new style he was focused in on. 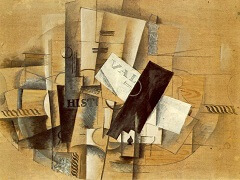 In 1931, Georges Braque added to the painting work, and began to do sculpture pieces as well. He gained some recognition with this, as he showcased a few pieces he had carved in an exhibit in 1933. In 1937 he had gained international success, as some of his works were displayed not only in Paris and around Europe, but even had made their way in to the US, and different art museums and exhibits in the US. During WWII, and following this period, the works which Georges Braque created, took yet another turn, and focused on darker, more somber pieces. Darker colors and dark scenes were much of what he painted. Following the war he focused on painting lighter subjects, he painted images of birds, landscapes of land, and he did many pieces which focused around the sea. During this period, he focused on more than just painting; Georges Braque also crafted many lithographs, sculptures, and he even did work on stained glass windows and creative design styles. 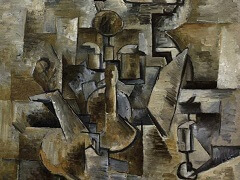 In his personal life, Georges Braque failed to ever take on larger scale projects; this was namely due to his poor health, which would not allow him to work on major pieces, or spend too much time focused on any individual piece. Although he did have issues with his health a majority of his life, this did not stop him from leading a new art movement, and developing one of the most famous art movements to transpire during the 20th century in the art world. 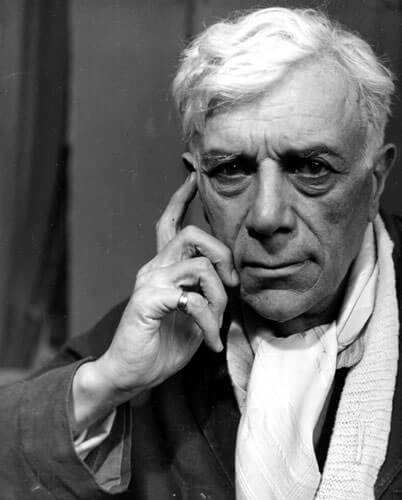 Alongside Picasso, Georges Braque may have been one of the most influential painters of the early 20th century. In addition to introducing Cubism, he also specialized in sculpture work, which he made a name for himself in Europe, as well as around the US with many of his distinct style pieces.